AquaBond offers professional gunite pool repair products ideal for gunite pool leak repairs, gunite pool crack repairs and pool plaster repair – underwater or above! Choose from sealant kits, epoxy adhesive kits, crack injection kits and pool repair staples kits… all specially designed to fix leaks and cracks in gunite, concrete and shotcrete swimming pools and spas. Gunite swimming pools are constructed by spraying a mixture of sand, water and cement onto a rebar frame. Since gunite is porous, a layer of pool plaster or other finish then has to be applied on top to act as a water barrier. 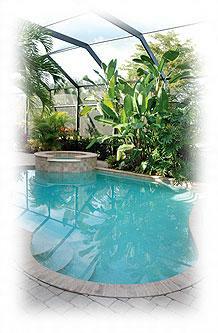 If pool plaster isn’t applied properly water can seep through even microscopic capillaries, causing damage. And as gunite pools age, even properly applied plaster will require repairs to address issues such as hollowing, egg-shelling or delamination. Gunite pools can also develop major structural cracks, usually due to shifting ground or the freezing and thawing of water that has managed to permeate the capillaries in gunite. The type and extent of the damage — as well as the type of repair products chosen — will determine whether or not the pool has to be drained in order to make the repairs. How extensive are the cracks? How much water loss is occurring? Have the leaking areas been identified? Underwater Repair Products for Gunite Pools - Mix, Apply and Cure Underwater. No need to drain the pool! AquaFlex Underwater Sealant is available in your choice of clear or white color, making it ideal for underwater sealing of pool plaster or other gunite finishes where color matching would normally be necessary. It can be applied to wide surface areas, whether on pool floors or side walls, and delivers a strong, flexible, invisible, waterproof seal down to 1/5000 thickness. Apply using our patent-pending polyethylene film application process. Underwater Repair Adhesive is a high-strength, professional, two-part epoxy adhesive designed to make long-lasting underwater repairs. A super versatile, underwater “glue” that provides long-lasting results, it’s available in off-white or gray and delivers a clean, paintable finish — making it ideal for patching and repairing gunite cracks in areas that are visible. AquaStitch is our revolutionary Stress Proof Stitch concrete crack repair staples system designed to permanently stabilize and repair structural cracks in concrete, gunite and shotcrete swimming pools and pool decks. Not just simple staples, AquaStitch mechanical stitches give cracked pool concrete a long-lasting repair that’s both mechanically AND structurally sound! Polyurethane Foam Crack Injection Kit for Leaking Concrete Swimming Pools provides permanent pool crack repair for leaking cracks and joints in concrete, gunite and shotcrete swimming pools and spas. The polyurethane foam in this low-pressure injection kit expands to 25 times its original volume and seeps into every crack and fissure – plugging the entire thickness of the concrete. Structural Repair Adhesive is one of the strongest and fastest repair compounds available for structural leaks and tile repair, whether the repair is occurring on a vertical or horizontal surface. Because it hardens in 5 minutes and is a non-sag adhesive, it makes for quick and easy gunite pool repairs. E-Z Patch® AquaBond enthusiastically recommends E-Z Patch products for all of your plaster and grout needs.